Victoria Tupper Kirby was invited by Black Cat Books in Manitou Springs (about 15 minutes from Colorado Springs, CO), to sign copies of her grandfather’s biography on Saturday, November 13, from 2-4 pm. Kirby, coauthor with her mother Jere True of Allen Tupper True: An American Artist, was in the area for the opening of the touring exhibition of her grandfather’s art work Allen True’s West at the Colorado Springs Fine Arts Center Museum. 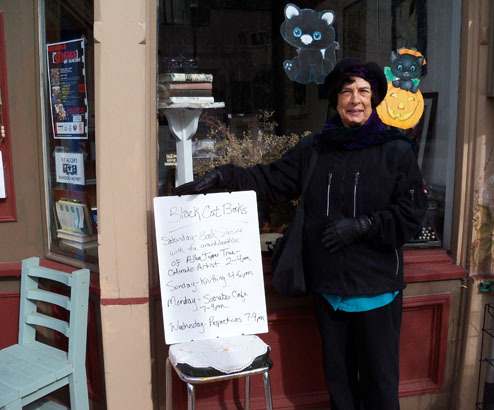 Saturday was a cold day, but Victoria and her sister Joan True McKibben (True’s other granddaughter) enjoyed exploring Manitou Springs, a delightful tourist destination with a beautiful old hotel, art galleries and speciality shops. Rachel Johnson, owner of the locally beloved bookstore, was a gracious and entertaining host.